Whether you love it, despise it or are simply not fussed about Nursery Decor, put your thinking cap on because if you are currently expecting, then you should also be expecting the New Baby Room to become your main area of residence for the next three years or so. For more experienced mums, you have been there and done that! You have carefully planned and designed the baby room before. Sadly, time only flows forward and so are the babies who become toddlers who then turn into pre-schoolers ever quicker! So, if you ended up with ‘Winnie the Pooh’ inspired room for your five-year-old who is now really into ‘Blaze and The Monster Machines, it all may seem a bit of a misfit. Think flexible, progressive and multi-factional design because decorating your little one’s bedroom can be a tricky business. Going overboard with unicorn theme can be easily done so try to play it cool and stay calm. If you follow a set of simple rules of design, you will create a trendy, practical nursery that will grow with your child’s changing needs. Move over lavender… 2019 is all about deep and nurturing cool-based colours such as mauve greys and hunter greens. Their soothing, earthy qualities are a perfect choice for modern thinking parents. Tonality is the key in this trend. Choose one neutral shade such as grey and layer different tones of the same colour for added depth and harmony. Look to the left and right of the colour chart and choose similar but slightly different shades of grey. You can incorporate them as accessories, furniture or textiles. If you are worried about making the room look gloomy, punctuate the space with bright pops of colour such as life-affirming Living Coral – Pantone Colour of 2019, also known as peachy orange! Use colours that complement the scheme rather than overpower it. A good point of reference will be the colour wheel showing you which colours go together. Some argue that Boho trend is not a trend as it has been around for centuries but folksy prints, vintage-inspired rugs and mandatory pom-poms have finally made it onto nursery scene. And what an exciting scene this is!... Bright, colourful and never boring. True feast for senses with textured accessories, bold patterns and a little bit of chaos for good measure. If you are drawn to colourful collections and unconventional art, this is where your creativity can take centre stage. No fancy rules to follow, think Dutch flea market meets Moroccan Souk! Pick a few individual pieces and don’t be afraid to put pattern on pattern! With an ever-growing tendency of parents not finding out baby’s gender till birth, this trend has caught on and by the looks of things it is here to stay. Bubble-gum pinks and Baby Blues are long gone. Say ‘hello’ to soft greys, cotton whites and simple wooden furniture which by the way, never goes out of style. This trend puts emphasis on subtle design elements of form and function. Light, modern elements with no fuss or no frills. To add visual interest, play around with texture and pattern keeping it neutral and natural. Scandinavians have been doing this for decades and their interiors are a testimony that aesthetics and functionality can go hand in hand. Designing a child’s bedroom or nursery should be an enjoyable task! Make sure your design reflects your style and the décor of rest of the house. Choose pieces that you love and you or the baby will never tire of them. Be practical and consistent and don’t feel you have to plan the whole scheme in one evening. Designing space takes time and sometimes you just have to ‘sleep on it’ before things become obvious. If you have any questions about Joanna’s Designing Services get in touch with Eklektik Studio at joannalandais@eklektik-studio.com and she will point you in the right direction. Creating a Million Dollar Child’s Bedroom! If you are a mother or a mother-to-be for that matter you will know exactly what I am talking about. The mighty ‘Nesting Instinct’ kicks in at around 30 weeks pregnant and you are hooked! Jaffa cakes and copious amount of caffeine-free tea get put aside and we are on a mission to create the most jaw dropping, eye-popping nursery ever created. From that moment onward, evenings become filled with Pinterest Boards named after our children who have not yet been born, but sure have a lot to look forward to once they see neatly arranged toys, playmats, tepees, cloud shaped cushions and whatever their mummies’ hearts desire. Ladies, make a list as I am breaking it down for you so you can put your feet up, grab that long overdue Jaffa Cake and let’s get going with Baby Decor ‘must-haves’! These babies took over 2018 by storm. From girly pinks to bold geometrics, wall murals have become ultra popular for their ease of use and a wide range to choose from. This glorified wallpaper comes with a hefty price tag but worth every penny for an instant make-over! Visit www.muralswallpaper.co.uk and see for yourself. Bling! The Metallics are in! Metallics continue to thrive in interior design only this time anything goes. Rose Gold, brass, copper, stainless steel even wrought iron won’t do any harm. 2019 is all about mixing reflective surfaces BIG and BOLD. Think princesses and knights in shining armour and you have something to go by. Think a statement wall or simply pattern bedding before you turn the little one’s room into a Rubik’s Cube. And even though babies at birth can only see 25 in front of their face, they do catch up pretty fast with their vision and your eye-catching scheme can have diabolical knock-on effects on that afternoon nap! Let The Power of Unicorn be with You! Unicorns are viral! Whether you are five or 35, unicorns never come out of fashion! Just like Marilyn Monroe’s red lips, Unicorn are here to stay for generations to come. 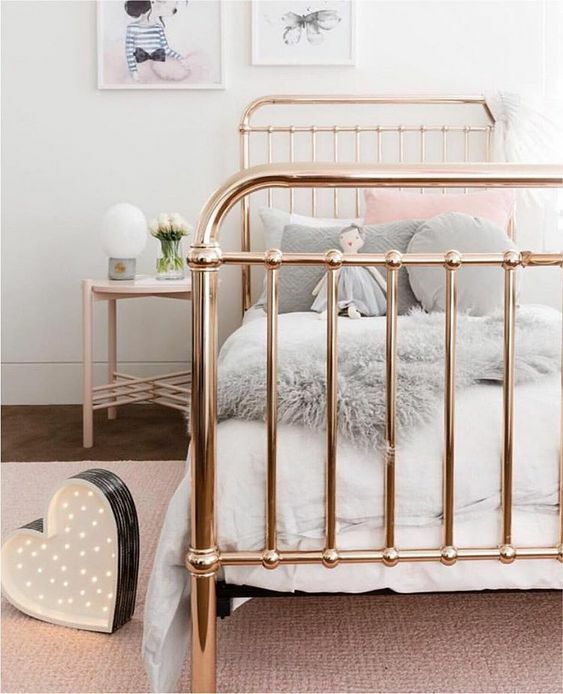 With staggering 7.5 million Instagram hashtags #unicorn, the trend is more popular than The Royal Wedding of Kate and William + Harry and Meghan put together… add Unicorn slime and Unicorn snot and you have your room scheme sorted! If you are a busy parent and have little time to plan your child’s bedroom, Eklektik Studio is here to lend a hand. From simple Kids Bedroom Ideas to Full-Interior Design Service. Schedule a free chat today!